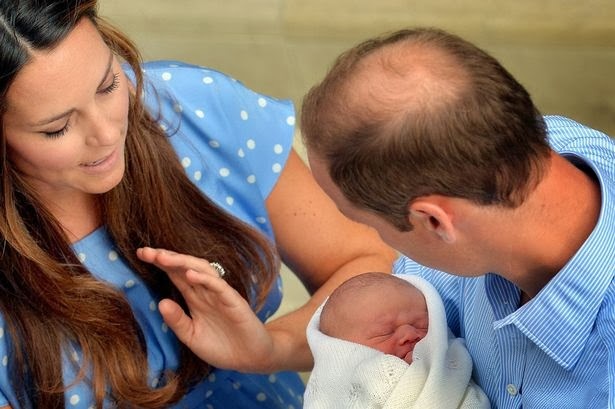 Britain's Duke and Duchess of Cambridge have chosen seven godparents for Prince George. The royal couple have decided to bestow the honour on "loyal" old school and university friends as well as William's cousin Zara Tindall, rather than William's brother Prince Harry and Catherine' sister Pippa Middleton as was expected. The official statement from Kensington Palace, made just ahead of three-month-old George's christening at the Chapel Royal at St James' Palace today (23.10.13), listed Oliver Baker - a university friend from St Andrews in Scotland - David Jardine-Patterson, who attended Marlborough college with the Duchess, and Earl Grosvenor - the son of the Duke of Westminster - as godparents. Jamie Lowther-Pinkerton, William and Catherine's private secretary between the years of 2005-2012, was also named as a godfather, as were The Hon. Mrs. [Julia] Michael Samuel, a close friend of William's late mother Princess Diana, and William van Cutsem, a childhood friend of the duke. William's cousin Zara Tindall - known as Zara Phillips before her marriage to England rugby player Mike Tindall - is the only family member to receive the honor. Meanwhile, the top secret guest list for today's low-key christening was also unveiled, and surprisingly didn't include some key members of the royal family. According to Sky News, only George's immediate family including his parents, great-grandmother Queen Elizabeth, great-grandfather Prince Philip, grandfather Prince Charles and his wife the Duchess of Cornwall and uncle Prince Harry will be attending the special occasion. The christening will be performed by the Most Rev Justin Welby. George's lengthy list of godparents isn't unusual for the royals, since his father Prince William has six.